We’d love your help. 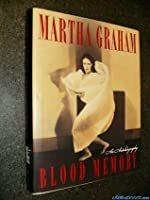 Let us know what’s wrong with this preview of Blood Memory by Martha Graham. Graham, the extraordinary creative force who ranks with Picasso and Stravinsky, broke traditional molds and ultimately changed the way we look at the world. Blood Memory invites readers to explore her phenomenal life and highlights the unforgettable images that encompass her work. 100 photographs. To ask other readers questions about Blood Memory, please sign up. this should be required reading for anyone who is seriously studying dance (especially dance history). martha graham is one of the most important people in dance history, and being able to peek into her mind is exhilarating. i felt like i was a kid listening outside a door to a very adult conversation--like i didn't belong there but unable to move out of fascination. even though sometimes you have no idea what the hell she's talking about (especially when she's describing the motivation behind h this should be required reading for anyone who is seriously studying dance (especially dance history). martha graham is one of the most important people in dance history, and being able to peek into her mind is exhilarating. i felt like i was a kid listening outside a door to a very adult conversation--like i didn't belong there but unable to move out of fascination. even though sometimes you have no idea what the hell she's talking about (especially when she's describing the motivation behind her dances---yeeikes), it actually helps you understand her better when you don't understand her (if you understand me). i enjoyed the first 2/3 of the book much more than the last third, at that point it got pretty convoluted. she also didn't spend very much time on subjects that i would have loved to hear more about (what really went down between her and erick hawkins, her relationship with halston). and although i loved the fact that she included dozens of pictures, they didn't correspond with the biography (pictures from the 1940s were in the end of the book when she was in her 70s). - "я была избрана стать танцовщицей, и с этим живешь всю жизнь"
- "его образ жизни был скорее европейским, но он стал американцем"
- "он глубоко чувствовал страсть и те прекрасные вещи, которые индейцы могли нам дать"
- "Рут Сен-Дени была божественной фигурой и глубоко религиозным существом, но еще она была артисткой"
- [Хелен Келлер] "была великой леди и очень забавной"
- Они хотели уйти еще до антракта, но Фредерик повернулся к ним и сказал: "Она в порядке. Просто она театральна"
- "Я снимала костюм и грим после выступления, когда в дверь постучали"
Ну, и так далее. Не упрощает задачу то, что Грэм писала "Память крови", когда ей было 96 лет, и даже Азарий Плисецкий по сравнению с ней может показаться блестящим мемуаристом. - если выбирать, какой свой балет показать ребенку 6-8 лет, Грэм выбрала бы "С вестью в лабиринт". The autobiography of one of the most intoxicatingly intense women who ever lived, it is a testament to talent and to passion, and to the unflinching certainty that being oneself is best. I borrowed this book from my dance teacher. Two chapters in I looked it up on Amazon and ordered my own copy. I knew it was one I would go back to over and over again. It is so much more than the autobiography of a dance legend. It is a book about life: life as dance and dance as life, creativity linked to the life of the soul. It changed my world. An almost stream of conscious memoir looking over 94 years of the life of one of the greatest artists of the 20th century. An intimate autobiography from an amazing woman. Recommended for anyone who wants an inside look at what drives the creative desire...not for dancers alone! Il s'agit essentiellement d'une succession d'anecdotes qui ont constitué la vie de Martha Graham. Elles n'ont pas une grande valeur littéraire et m'ont un peu laissées sur ma faim: ces grands moments disent assez peu du quotidien. Mais il y a aussi quelques pages essentielles. Céline Minard aurait-elle lu ce livre ? : "... les dons du funambule. Comme lui, nous avons tous un jour ou l'autre, marché en équilibre sur le fil des circonstances.Nous connaissons comme lui la force d'attraction de la p Il s'agit essentiellement d'une succession d'anecdotes qui ont constitué la vie de Martha Graham. Elles n'ont pas une grande valeur littéraire et m'ont un peu laissées sur ma faim: ces grands moments disent assez peu du quotidien. Mais il y a aussi quelques pages essentielles. Martha Graham is probably the most well-known name among today's modern dancers. She existed from 1894-1991, but will undoubtedly be remembered forever. When I saw that she had written an autobiography, I had no choice but to dive right in. Videos of her dancing can be found all over the internet and I couldn't wait to put a personality to the figure. I have no regrets. In Blood Memory, Martha spills her guts. She tries to completely reveal her insides through powerful words. Her purpose of writi Martha Graham is probably the most well-known name among today's modern dancers. She existed from 1894-1991, but will undoubtedly be remembered forever. When I saw that she had written an autobiography, I had no choice but to dive right in. Videos of her dancing can be found all over the internet and I couldn't wait to put a personality to the figure. I have no regrets. In Blood Memory, Martha spills her guts. She tries to completely reveal her insides through powerful words. Her purpose of writing this was probably to get it all down and quench the thirst of thousands of inquisitive minds. 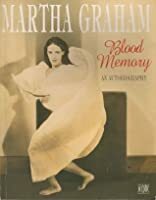 Most people who know of her clearly see her unbelieveable talent and flair, but without her very own words to explain what goes on within the dancing masterpiece, we could never be 100% positive of who Martha Graham really was. Martha Graham was an intricate little creature. She felt so passionately and was able to transfer that ireeplaceable magic into her memorable choreography. She knew that dance was a way of life expression, not just another sport or hobby. Dance is art, and Martha conveyed these principles more than anyone else I have come across. She says, "..art is eternal, for it reveals the inner landscape, which is the soul of man." (page 4) I fully believe in this statement. Throughout her book, she compares dance to life, saying at one instance, "Whether it means to learn to dance by practicing dancing or to learn to live by practicing living, the principles are the same." (page 3)She writes, "Many times I hear the phrase 'the dance of life'. It is an expression that touches me deeply, for the instrument through which the dance speaks is also the instrument through which life is lived-the human body." (page 4)She makes it crystal clear how completely she has thrusted herself into the life of dance and how she stays true to this passion straight through to her core. As the quotes above reveal, Blood Memory was mosly written as a description. Her perfect and intriguing word choices only draw her audience in further. I think she really does an excellent job of protraying herself and her innermost thoughts. I really enjoyed the first part of this book. Reading about her childhood influences, Her time with Ruth St. Denis and Ted, and her early evolution as a dancer. However, I felt the book started to become an trip through name dropping more as it progressed. Not that there weren't gems and inspiration to be found later in the book, but I would have probably ranked it higher if the second half was more like the first. Just finished today. If you take it for what it is, knowing Martha's racial/socio-economic background, you can take what speaks to you and leave the rest behind. Don't remember the last time I read an autobiography/memoir but there's only so much me-ism I can tolerate before it gets to be too much. Still there are quite a few gems of insights about dance and parallels to life. She was quite a woman of her time. I feel I have a better grasp of modern dance after reading about Martha's life in her own words. I was strictly trained as a classical dancer and, I must admit, I have often turned up my nose at modern dance. I am trying to have a more open mind and heart in all matters, so I decided to read Blood Memory and I definitely was not disappointed. I was inspired and intrigued. Not unlike Katherine Hepburn's autobiography, except for the events; a very egocentric (yes that is necessarily the nature of anyone's memoirs, however Graham, like Hepburn, is simply breathless over her endlessly fascinating life - it's a bit much) account of a life spent dancing. Wonderful photos throughout. 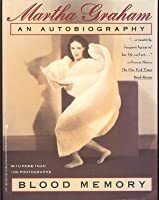 Being brought up on the Martha Graham technique, I couldn't help but be moved by her autobiography. Even her words had a special kind of movement about them. One remarkable lady who lived a remarkable life. A beautiful genius. Such an incredible woman and legacy. I thought that Martha just jumped off the pages with her Marthaisms in this book. One should rad between the lines on this one. I forgot how beautiful this book is. Great for a bit of artistic inspiration. Un must have per chi lavora con il corpo. Un approfondimento di come una personalità così forte abbia saputo affermarsi e dichiarar si attraverso i suoi lavori. bellissimo! Life from the discerning eyes of a dancer: the spiritual mixed in with the vain, the volatile, and the violent, with no application of a filtered third-party self-review. Inspiring, personal and just brilliant. Martha Graham shares her experience with dance, family and passion. The book is an internal glimpse into many people!!! Thank you for existing on this planet, Martha Graham. This woman was mad and a genius and reading her autobiography gives you an insight into her world that made clear how to actually move in her technique.